The safest way to support fragile textiles is to store them flat. 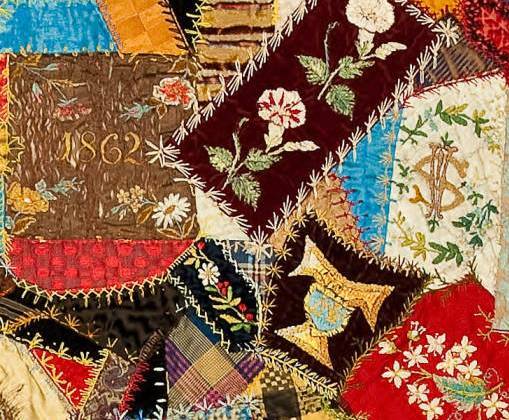 All too often flags and quilts hang in museum exhibition galleries, stressing the fibers unevenly and weakening the artifacts’ structures. The Gerald R. Ford Conservation Center at the Nebraska State Historical Society has posted helpful directions for making slant board mounts for quilts. These experts recommend using medite/ medex or aluminum honeycomb as the base of the slant board and then covering it with one or more layers of needle-punched polyester batting, followed by a layer of washed, unbleached muslin, and topped with a layer of white cotton velveteen. These materials are all great ideas to think about to begin strategizing exhibit mounts for your large textile artifacts. Here are a few additional ideas, concerns, and material options for slant board mounts. Boards: However, keep in mind that if you use any wood product, such as medite, you will need to seal it appropriately. Aluminum- and coroplast-based mounts will be quicker to produce and safer for long-term preservation, so carefully consider the cost-benefits of the materials you select, depending upon the duration of the exhibit or rotation. For lighter-weight textiles, such as most flags or laces, archival board is probably plenty sturdy to use as a frame base. Angles: The linked directions also recommend 20-60 degree slants. Steeper slants often work best for exhibit designs, especially for large textiles, because the footprint of low-angled mounts can be impractical. Smaller and lighter weight textiles are often well supported at a steep angle. 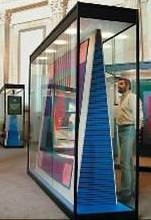 Exhibits at the (now closed) Quilt & Textile Museum in Lancaster, PA, incorporated steeply angled slant board mounts, made from metal boards, into their display cases. Fabrics: Another fabric covering idea that can be a good choice for slant board mounts is polyester fleece. 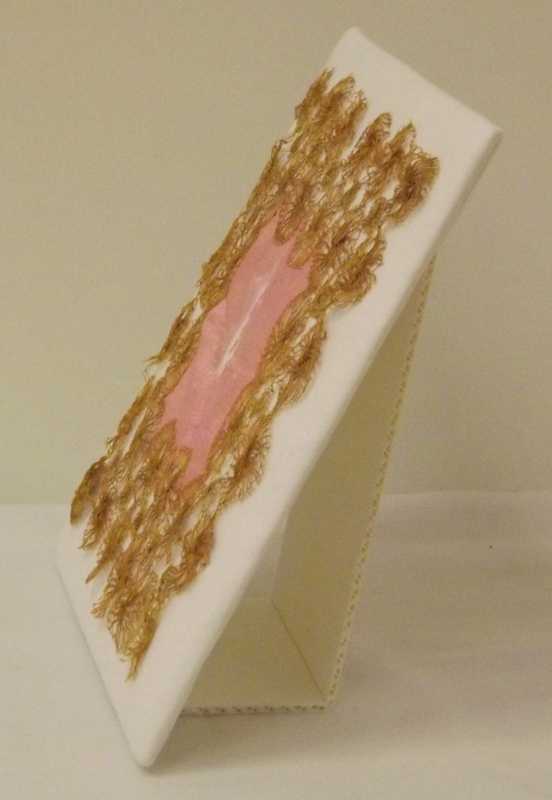 Its fuzzy texture works to grip the textile artifact on top, similar to velveteen. 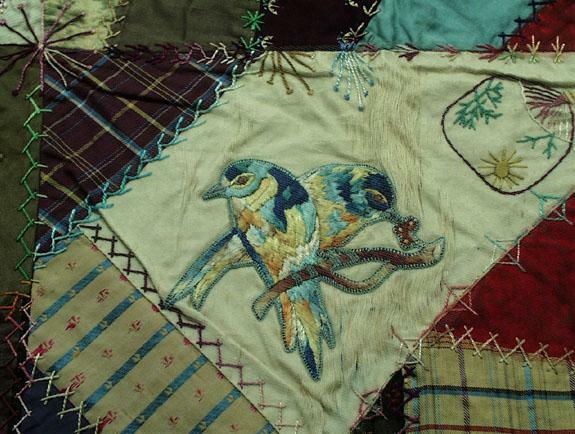 It comes in colors that are fairly safe from bleeding and fading, and fleece is often an inexpensive option. It is also stretchier than velveteen, which makes mount covering much easier. Cotton jersey is another option with this advantage but is less colorfast. Conservators recommend avoiding acrylic-resin-bonded polyester batting. However, it is difficult to find non-bonded or thermal-bonded batting in local fabric stores. Contact Test Fabrics for pricing on these more preservation-appropriate options. A C2C workshop participant crafted the mount on the left with archival board, polyester batting, and white cotton jersey. Even though the kickstand forms a steep angle, the “artifact” has remained on the mount with no pins or stitches. Securing: For quick mount-making, the fabric covering can be taped on the backside of the board. Gaylord’s archival packing tape is a reasonably safe choice. Sewing a narrow border pocket around the cover fabric, threading twill tape through the pocket, and pulling/ tying it like a drawstring is a good technique to keep the fabric cover tight against the board and securely in place. This post is by Perry Hurt, Conservator at the North Carolina Museum of Art, and based on a thorough study of mounting practices for El Anatsui’s works in art museums. Perry is also an instructor for C2C’s upcoming workshop, Preventative Conservation for Visual Arts. This week a retrospective exhibition of the work of Ghana-born sculptor El Anatsui opens at the North Carolina Museum of Art. Among the most breathtaking works on view are several wall sculptures formed by metal bottle tops, strung together by wire. Mount making for sensitive artifacts is always challenging. 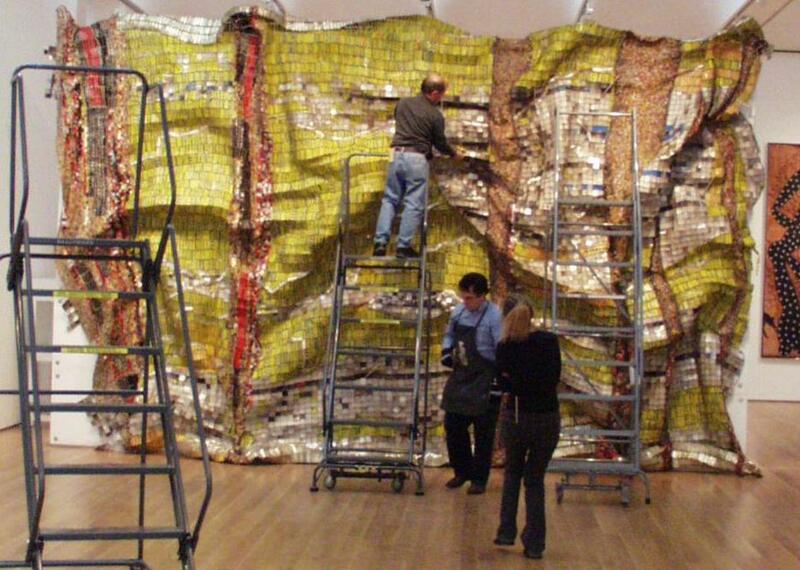 But with El Anatsui’s art, NCMA staff had to devise especially creative handling, support, and display solutions. Perry Hurt and other NCMA staff members install "Lines That Link Humanity." As a preparatory step, staff covered the display wall with 1-inch-thick, high-density Ethafoam using drywall screws and fender washers. To begin installation, we laid the long accordian-form bundle of the artwork at the base of the gallery wall. A large tube and lifts were positioned as closely to the wall and as low over the artwork as possible. Approximately four handlers grasped the top of the artwork, raised it, and folded it over the top of the tube, pulling approximately a quarter of the work over the top as counterbalance to the rest of the piece. Handlers slowly raised the tube, sometimes pausing to untangle the artwork. On stair towers they kept a hand on the tube and artwork at all times. The tube was raised to position the bottom of the artwork approximately where it would be when installation was complete. At this point the handlers pushed the artwork hanging below the tube against the display wall and inserted chopsticks into the underlying foam approximately every 2 feet, horizontally and vertically. Once the whole area below the tube was anchored to the wall, the top part was lifted off the tube and anchored to the wall with chopsticks. Installation required approximately seven handlers and took a couple of hours (excluding wall prep). Chopsticks worked well for anchoring because they are strong yet relatively soft and less likely to damage the work than metal hardware. Also, as the work was sculpted, redundant sticks could be seen easily and removed. Working from the bottom up during the sculpting phase avoided excessive pulling and weight loads on the area being manipulated. Approximately 150 chopsticks were prepared by slightly sharpening the point with a grinder. Sculpting took place with a curator and a few handlers over two or three days’ time, spread over several weeks. The overall shape ebbed and flowed, changing many times. In some cases manipulation and shaping required additional building out to create folds and raised forms. In this case blocks of Ethafoam can be slipped behind the artwork and anchored into the existing foam. For the next phase of installation, staff replaced the chopsticks with clear, extruded acrylic rods (1/8 to 3/16 in. diameter), cut to various lengths (2” – 5”). The top ends were rounded and the other end sharpened. (The shaping of the ends takes a little practice, since the acrylic softens when pushed into a grinding wheel for too long.) Short, thicker acrylic rods were used as much as possible, inserted at a slightly upward angle to support the artwork. These short rods are very rigid and more stable, but, as stated above, they can only be used where the wall sculpture fabric is very close to the Ethafoam surface. Not all areas could be evenly supported because of their shape or their distance from the wall. Some areas received more support to relieve some of the load. With the assertive forms of our sculpting, the majority of the wall sculpture stood well out from the wall, more than 12 inches in some areas. Staff placed longer rods wherever they could effectively take the weight of the artwork. The longer, thinner rods are somewhat flexible. Their flexibility can be used to conform and support under shelves in the shape of the artwork, loading them like a spring. All rods were inserted in line with the “grain” of the artwork, which made them less visible. Clear rods do not influence the shadow cast by the work, which in some cases is an important aspect of the installation. Ultimately, the final shape was established. The shape of “Lines That Link Humanity” intentionally exceeds the outlines of the “floating” gallery wall. This gives the artwork a stronger three-dimensional effect. The support of extended, free-standing parts of the wall sculpture was accomplished with longer rods. In some cases several rods were used, inserted at different angles and crossing. But in some places, the fabric of the artwork slid down the smooth rods and would not stay in place. This was remedied by wiring the artwork to the ends of the rods using new copper wire. It was necessary to score the end of the rod to give the wire some purchase. Ultimately about seven hundred rods were used. This was actually less than we originally thought necessary. Even fewer rods could have been used and still safely supported the weight of the artwork. But in anticipation of dusting the artwork several times a year, we thought a bit more support was appropriate. We also judged that added support, particularly in the lower areas, was required to counter any accidental contact from our visitors. 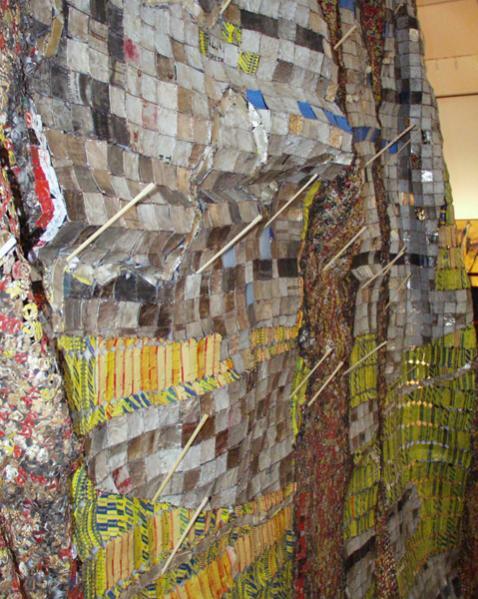 Come see the El Anatsui exhibit, admire the artwork, and marvel at its mounts! Thanks to Terry Hammond, Founding Director & Curator of the Guilford College Art Gallery, for contributions to this post. When you are a staff member at a small museum and in charge of diverse initiatives, all the rules concerning preservation can be daunting and even discouraging. Most folks working with cultural heritage collections know that acid-free tissue and boxes are good materials for collections storage. Another material to keep in mind and rely on to be preservation-appropriate and versatile is ethafoam. Made from polyethylene, one of the safer plastics, ethafoam planks are 2” thick or more and are easy to carve by using any new serrated edge knife. The foam will dull the blade fairly quickly, so dollar-store types are a good option. For most purposes, you should cover the carved ethafoam with a layer of tissue, tyvek, or muslin, as the carved edges can be somewhat abrasive. Riser blocks: wood can emit harmful acidic vapors that an exhibit case’s microenvironment will trap and intensify, leading to the degradation of artifacts. Ethafoam can be cut in squares or stacked to varying heights and is dense enough to support (and slightly cushion) most objects. Storage mounts: carve a cavity for an artifact to rest inside or brackets to protect extrusions. Carved ethafoam can also be used to support the ends of a rolled textile storage tube, keeping the artifact suspended above a shelf. Click here for some helpful video instructions for creating ethafoam cavity mounts. Display mounts: planks can be stacked, glued, and then carved into hat mounts and even manikins. Tried and true directions for building a manikin out of ethafoam will guide you in this task. The main draw-back of ethafoam is its price. However, there is an ethafoam manufacturer here in North Carolina—Hibco Plastics—which sells the product for at least 30% less than the cost preservation product suppliers charge. Hibco’s factory is in Yadkinville, just west of Winston-Salem. The company sells ethafoam in bulk to museums all over the country. The advantage for institutions close by is that Hibco will fabricate smaller orders for pick-up. If you are interested in ordering ethafoam from Hibco and arranging pick-up orders, contact Chris Pavlansky, Sales and Marketing, T: 800-849-8683 Ext. 138, F: 336-463-5591 (cpavlansky@hibco.com). Ethafoam is a product that exemplifies how buying in bulk can save a great deal of money. Remember, networking with colleagues from other museums and historic sites for coordinated supply purchasing can be a way to “do more with less–” an imperative we all face in today’s cultural heritage institutions.